Not everyone is into touchscreen phones, some of us wants a physical keyboard. 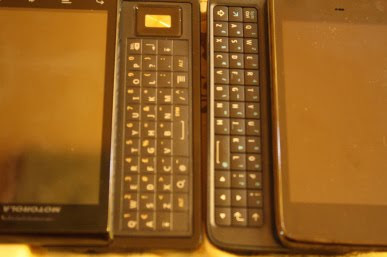 But not all phones with slide-out QWERTY keyboard are created equal so let me compare two of the most sought after QWERTY-keyboard phones in the market today: The Motorola Droid also known as the Motorola Milestone in Europe and the Nokia N900. 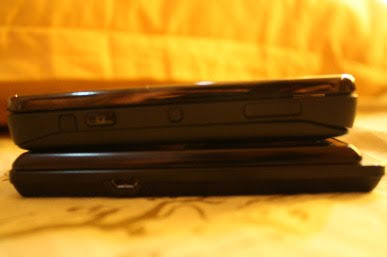 Obviously, the Nokia N900 is the thicker of the two mobile phones. 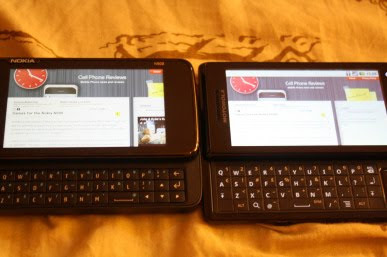 In fact, the Motorola Milestone is only as thick as the N900's physical keyboard. 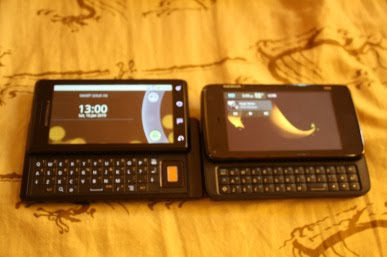 The N900 is also the shorter of the two handsets, just about the size of the Motorola Milestone's screen which is understandable considering that the latter has a bigger screen size. 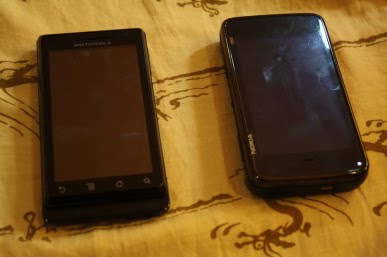 On paper, the Nokia N900 is heavier than the Motorola Droid but for me, it seems the Droid is heavier. The Motorola Milestone wins the design award because it's just so thin and less of a brick to carry around. As for the QWERTY keyboard the Nokia N900 has three layers of QWERTY keypad with a nice tactile feel, the Motorola Droid has four layers of QWERTY keypad and a large directional key on the right. The keypad on the Droid is somewhat flat and I have a tendency to mistype a lot on the Milestone than on the N900 so the best QWERTY keypad award goes to the N900. 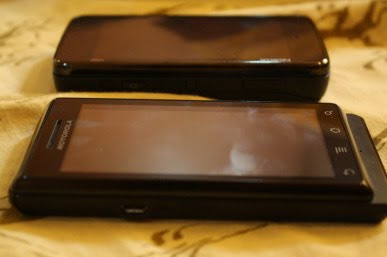 The Nokia N900 has a resistive touchscreen while the Motorola Milestone has a capacitive touchscreen. You don't have to press the screen as hard on the Milestone compared with the N900 and the Milestone provides a much more fluid kinetic scrolling compared with the N900. Both handsets have three homescreens which you can add shortcuts or widgets to. The screen on the Motorola Milestone is also much more responsive compared with the N900 as I don't know if you really need to double tap an icon to get a program to open on the N900 or the screen is really just unresponsive. If it's the former, it kills the user interface because a lot of people, including me, prefer one click access to programs. On the other hand, the N900 has a very nice task manager/switcher which you can gain access to on any programs. The Milestone doesn't seem to have that (or maybe I'm just missing it) unless you download a third party program but most programs on the Android marketplace are task enders and not switchers. It's almost a tie on the User interface award but I'm leaning a bit towards the Droid because of the more fluid UI but don't count out the N900 yet. A few more fixes from Maemo and I'm sure those annoying double taps would be gone and it would more or less tie the UI between the two handsets. As for the messaging features, again, it's almost a tie. Both mobile phones feature threaded messaging and both support Microsoft Exchange although I heard that the N900 doesn't support Exchange 2003. Anyways, setting up your email accounts is really easy but again, the Motorola Droid has the slight upper hand because it supports MMS messages. Phonebook on both handsets are almost identical. You can get thumbnail images of your friends while sorting through your contacts. As for finding your contacts, the Motorola Droid features a much appealing way of looking for your contacts, you can hold the screen and then move your fingers up and down to scroll through your contacts alphabetically but Nokia N900 features a faster way of looking for your contacts by just typing their names on the keypad. Basically, I'll leave it up to you whether you prefer beauty over efficiency. The clear winner in this department is the Nokia N900. The N900 has a better native audio player and can playback divX videos. But viewing videos is more appealing on the Motorola Droid because of its screen resolution. Also, if you download MixZing Lite for Android, you'll get a better music player than on the N900 with the former having the ability to automatically recommend songs for your and tag your music with albumart. 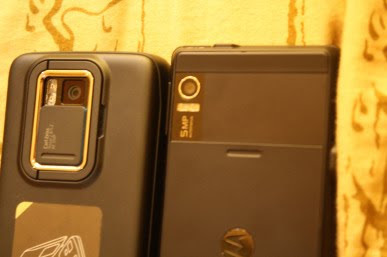 As for audio quality through the speakers, bass-centric people will lean towards the N900 more but the Motorola Milestone's audio quality offers better midranges. The Nokia N900 offers faster rendering of webpages and flash support so it should be the winner of the best browser right? Well, if speed and flash are your only considerations in a good browser then yes, but for me, the UI of the Motorola Milestone's browser is better than the N900. Why? Although the Nokia N900 can finish loading a webpage faster than the Motorola Droid, I sometimes still see that checkerboard pattern when scrolling through pages whereas there's no checkerboard on the Motorola Milestone. Another thing is the zooming factor. With the Motorola Milestone, you get multitouch zooming so let's say you're holding the handset in landscape mode with the QWERTY keyboard out, you want to zoom in on a page, you just use both your thumbs to zoom in and out, everything is natural, no awkward hand movement. On the N900, if you want to zoom in, you can either use the swirl-zoom feature or the volume rocker. The swirl-zoom feature is a waste of time while using the volume rocker to zoom in is a bit awkward since the volume rocker is a bit flat and you can't really zoom in on a specific part of the paga because the volume rocker zooms in on the center of a webpage. Anyways, for me, the Motorola Milestone still has a better browser but then again, if you're in the states and since your Droid doesn't have multitouch, the N900 then would be a better browser. Both mobile phones offers 5 megapixel camera with dual LED flash. The Nokia N900 has a faster shutter speed but as for picture quality, I'll leave you to decide. Here are some sample pics taken with the Nokia N900 and the Motorola Droid. Without a doubt, the Motorola Milestone is the winner in this department. The Motorola Milestone's batter lasts 1 1/2 day with medium to heavy use while the Nokia N900's battery only lasted a day with minimal use. It's really hard to put a clear winner. On one hand, out of the box, the Nokia N900 wins the best multimedia phone and best QWERTY keypad, audio quality is good too but on the other hand, the Motorola Milestone with MixZing media player and hopefully with future DivX support would hold its own in the multimedia category. The user experience is nice on the Milestone and it's also good as a touchscreen phone by itself without the QWERTY keypad whilst the Nokia N900 is basically useless as a touchscreen phone without the QWERTY keypad. As for applications, the Android Market has a lot more apps already out compared with the N900 which is a younger mobile OS compared with the Mielstone but I see a lot of potential for the N900 especially if developers continue developing cool applications for latter. But in my own opinion, I would prefer the Motorola Droid based on user experience. There's a lot more kinetic scrolling action on the Milestone and it offers a lot more options to users. I mean, if you prefer a touchscreen phone, then just use the Milestone as it is, without the keyboard and it still works great and if you need a physical keyboard, just slide out the QWERTY pad and you get a REALLY good browsing experience especially if you're a blogger on the go. Again, this is just my opinion and if Nokia is able to add a better zoom option on the browser or a more fluid kinetic scrolling which no doubt is not that far off considering they've been recently updating the N900's firmware these past few weeks, then I might gravitate to this device. But for now, I think I'll stick with my Milestone as my primary mobile phone. So the droid and milestone is one and the same phone? Aside from the multitouch you mentioned, what other differences do they have? Considering that both mobile phones are on equal footing the Milestone's price with a T-mobile contract has tipped the scales in favor of the Milestone. Nokia N900 all the way, baby! Droid truly allows for customization. Yes, i know you can jailbreak your iPhone and go nuts. But you also void your warranty in doing so and risk bricking your phone. Android "allows" people to do what they want and that is truly refreshing. most unquie at this time, is that it has a full flash 9.5.